Under MEP’s continued support for the World Bank’s West African Regional Fisheries Programme (WARFP) in Sierra Leone and Liberia, a pilot electronic data collection project has been set up in two Liberian fishing communities, West Point, Monrovia and Robertsport. The data collection system selected for the pilot, aims to link vessel tracking system technology with mobile phone technology, combining information on fishing effort, with information on the fish landed from tracked fishing trips. A range of solar-powered vessel tracking systems have been selected for trial on artisanal canoes, including AIS satellite systems provided by Stone 3 Ventures and Exact Earth, and inshore GSM systems designed by Pelagic Data Systems. When tracked canoes come ashore to offload their catch, fish landings data (volume, species group and first sale value) are collected by trained enumerators who enter data into specifically designed landing forms on mobile phones at landing sites. Completed forms are then sent via cellular networks to a Google cloud server. Common factors in both tracking and landings datasets, such as date and canoe registration number, allow linkages to be made. This pilot aims to demonstrate a system which can gradually build a picture of fishing grounds and what catches are yielded from these grounds. 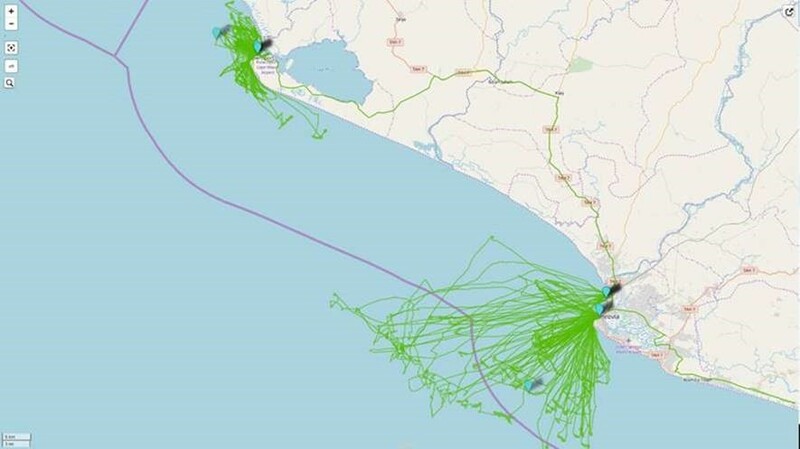 The image below shows some of the tracks recorded to date by Pelagic Data Systems units in relation to the 12 nautical mile limit (purple). The furthest ranging canoes are the larger wooden Fanti canoes with fishing trips of up to 5 days long.